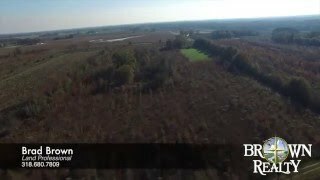 Comments – Little Creek Whitetails high fence deer hunting in Richland Parish, LA. It is a great package that offers the buyer opportunities to take trophy whitetails year after year. The tract was stocked with 30 bred does with high end blood lines and 3 breeder bucks with superior genetics in January of 2013. All these can be verified upon request. The does have had three fawn crops meaning 2 year old bucks can be harvested now and 3 year old bucks in the fall of 2016. The habitat is excellent consisting of CRP, Oats, Alfalfa, Clover and tons of browse. Property contains two submersible irrigation wells for fresh water and irrigation, plus three 2000 lb gravity flow feeders. Tract is accessible by state highway and dead end gravel road. All fencing on this tract is galvanized and top notch with good neighbors. Good high ground with productive soils with multiple sites for your cabin. CRP income is just shy of $18,000.00 annually through 2021. Deer herd is estimated to be 100 now. A must see and the price is right! !